The MSU Center for Interdisciplinarity (C4I) is a research center in two senses. First, it serves as a resource for interdisciplinary researchers at MSU and beyond. 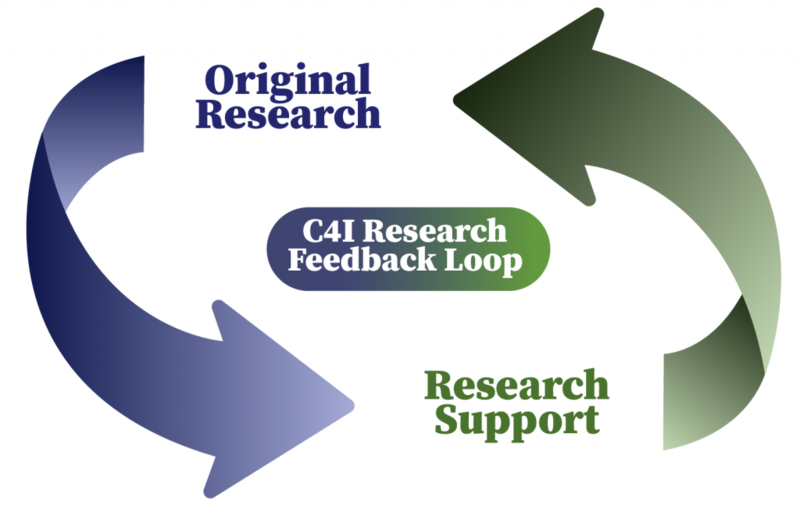 Through various mechanisms, such as Toolbox dialogue workshops and the Transdisciplinary Graduate Fellows Program, C4I provides support for researchers and others engaged in the difficult business of crossing disciplinary boundaries in search of complex responses to complex problems. See the “Resources” and “Graduate Fellows Program” pages of this website for more information on our resources for interdisciplinary researchers.Second, C4I conducts original research on interdisciplinarity understood as activity (e.g., research, education) that integrates disciplinary inputs into mutually dependent combinations. Our research concerns various aspects of interdisciplinary process, including integration, communication, and collaboration. This original resource is a source of new ideas that are folded into the resources we make available to interdisciplinary researchers, creating an evidence-based feedback loop that forms the central dynamic of our research efforts. These research products include those linked below. Cardenas, E., Rodegher, S., Hamilton K. (forthcoming) Collaborative Practice in Arts Integrative Work: Mechanisms for Advancing and Expanding the Field. O’Rourke, M., Crowley, S., Laursen, B., Robinson, B., Vasko, S. E.(forthcoming). Disciplinary diversity in teams, integrative approaches from unidisciplinarity to transdisciplinarity. In K. L. Hall, A. L. Vogel, and R. T. Croyle (Eds. ), Advancing Social and Behavioral Health Research through Cross-Disciplinary Team Science: Principles for Success. Berlin/Heidelberg: Springer. Hall, T. E., Piso, Z., Engebretson, J., O’Rourke, M.(2018). Evaluating a dialogue-based approach to teaching about values and policy in graduate transdisciplinary environmental science programs. PLoS ONE. 13(9): e0202948. Kjellberg, P., O’Rourke, M., O’Connor-Gomez, D. (2018). Interdisciplinarity and the Undisciplined Student: Lessons from the Whittier Scholars Program. Issues in Interdisciplinary Studies. Forthcoming. Klein, J. T., O’Rourke, M. (2018). Review of Interdisciplinary Discourse: Communicating across Disciplines, by S. Choi and K. Richards (London: Palgrave Macmillan, 2017). Integrative Pathways. 40(3): 6-11. O’Rourke, M. (2018). Review of Interdisciplinary Knowledge Organization, by R. Szostak, C. Gnoli, and M. López-Huertas (Berlin/Heidelberg: Springer, 2016). Integrative Pathways. 40(2): 7-15. O’Rourke, M., Crowley, S., Laursen, B., Robinson, B., Vasko, S. E. (2018). Disciplinary diversity in teams, integrative approaches from unidisciplinarity to transdisciplinarity. In K. L. Hall, A. L. Vogel, and R. T. Croyle (Eds. ), Advancing Social and Behavioral Health Research through Cross-Disciplinary Team Science: Principles for Success. Berlin/Heidelberg: Springer. Forthcoming. O’Rourke, M., Eigenbrode, S. D. (2018). Woody Weeds communication survey #3 report. 1 January. Prepared for the Woody Weeds Project, http://woodyweeds.org/. O’Rourke, M., Hall, T. E., Boll, J., Cosens, B., Dietz, T., Engebretson, J., Goralnik, L., Piso, Z., Valles, S., Whyte, K. (2018). Values and responsibility in interdisciplinary environmental science: A dialogue-based curriculum for ethics education – Student kit. Online curriculum available at <http://eese.msu.edu/>. O’Rourke, M., Hall, T. E., Boll, J., Cosens, B., Dietz, T., Engebretson, J., Goralnik, L., Piso, Z., Valles, S., Whyte, K. (2018). Values and responsibility in interdisciplinary environmental science: A dialogue-based curriculum for ethics education – Instructor kit. Online curriculum available at <http://eese.msu.edu/>. Rinkus, M. A., Kelly, J. R., Wright, W., Dobson, T., Medina, L. Gendered considerations for conservation fieldwork. Society and Natural Resources, 31(12): 1419–1426. Robinson, B., Gonnerman, C., O’Rourke, M. (2018) Experimental philosophy of science and philosophical differences across the sciences. [Preprint] URL: http://philsci-archive.pitt.edu/id/eprint/15025 (accessed 2019-01-18). Valles, S., Piso, Z., O’Rourke, M. (2018). Coupled ethical-epistemic analysis as a tool for environmental science. Ethics, Policy & Environment. Forthcoming. O’Rourke, M. (2017). Comparing methods for cross-disciplinary research. In R. Frodeman, J. T. Klein, and R. Pacheco (Eds. ), Oxford Handbook of Interdisciplinarity, 2nded. Oxford: Oxford University Press. Pp. 276-290. O’Rourke, M. (2017). Scientists’ attitudes on science and values: Case studies and survey methods in philosophy of science. Studies in History and Philosophy of Science Part A63: 22–30. DOI: https://dx.doi.org/10.1016/j.shpsa.2017.04.002.